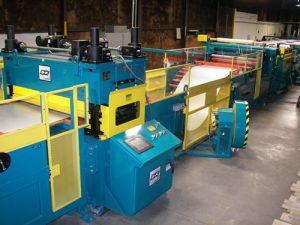 Coil Processing | Wrisco Industries Inc.
WRISCO INDUSTRIES INC. delivers Cut-to-Length Coil Metal Processing at each of our four Divisions. The Cut-to-Length equipment lineup includes Mestek Machinery’s Iowa Slear 1 and Slear 2 with B & K Leveler located in Atlanta and the Mestek Machinery Iowa Slear 1 with B & K Leveler housed in Dallas. 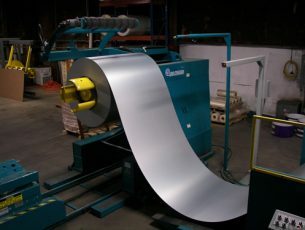 Teamed with five other Cut-to-Length and Slitting Lines throughout our Divisions, Wrisco can sheet, blank, slit, slear, level and recoil with extremely tight tolerances up to 60″ wide coil in gauges .018 through .125 in aluminum and 48″ wide coil in 24 gauge steel. Custom slit coils and cut-to-length pieces are available upon request. Whether it’s painted, anodized, 70% PVDF, mill finish, aluminum tread brite or painted steel, you can appreciate the speed, quality and precision metal processing that only Wrisco has to offer!